Anyways! We finally realized “Hey, we love each other” so we started dating on December 14, 2015. We spent our first Christmas together which was perfect, our first New Years as a couple and our first Valentine’s Day. Which turned out to be the day Michael asked me to spend the rest of my life with him. Yes, only after 2 month. Hold off on your judgement, it only gets better. We then started planning our wedding and wouldn’t you know… 2 months after that we were MARRIED and expecting a baby that the doctors said we couldn’t have. As the year went on we got the opportunity to experience so many new ‘firsts’ together and here we are getting so close to welcoming our baby girl into the world! So many ups and downs, tears and laughs, adventures and simple nights at home… I would have never in a million years thought that I would be where I am today and with Michael Smith, the man of my dreams. I am so thankful for the wonderful year he has given me. So even though our anniversary isn’t until tomorrow, he decided that we would start celebrating tonight. I’m sick so we had Salmon Stew (YUM), and no we don’t have a dining room let alone a kitchen table so we work with what we got! 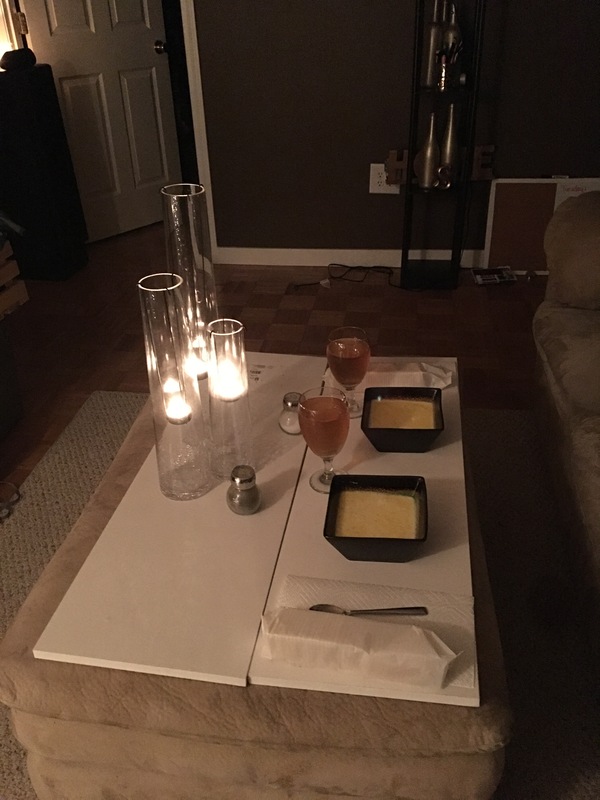 We had a candle light dinner, exchanged gifts and now we are spending quality time together like most people do. He’s playing Xbox and I’m coloring 😂 and yes, before you ask, it is infact green tea in our glasses, 1. Because I’m pregnant and 2. We do not drink. So day 7 on our countdown is complete!